Alien Explorations: Alien Covenant : "Baby Neomorph spine out," concept art (2016) by Stephane Levallois. Alien Covenant : "Baby Neomorph spine out," concept art (2016) by Stephane Levallois. 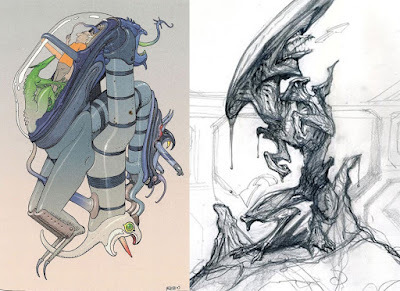 a) Stephane Levallois drew the Neomorph backburster after it had erupted from the back of someone leaning on the table. 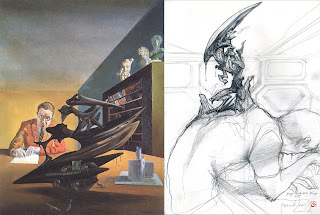 When I first saw it around December 21, 2017,perhaps I thought it looked like some sort of abstract Bakugan but then I realised that it appeared to reference Dali's portrait of Emilio Terry. Ridley's response about the resulting drawing, "Good, but the creature, "plou petite...""
b. i) Viewing the image that Levallois drew, the creature started to make me think of some sort of configuration like the Henu Barque, and perhaps it was. 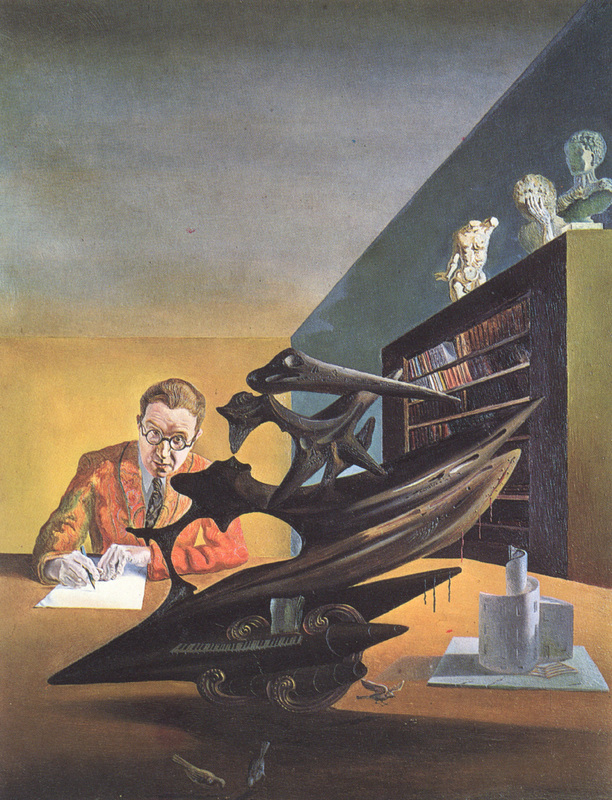 b. ii) However a while later, on Wednesday the 20th of December 2017, I saw Dali's Portrait of Mr Emilio Terry (unfinished) from 1930 and I connected the two, whether one was connected with the other or not, and then later realised that the strange dark structure in Dali's painting partly referenced the Henu Barque. b. iv) Exploring the comparisons between the two appears to be quite difficult because finding words is a little hard. b. v) They are both contain a strange dark form with lots of negative space elements and someone could explore merging the two things together. b. viii) It has forms that can be turned into crouching legs, although the backburster's own legs would be far smaller. b. ix) The creature's arm on the right becomes like the extending material to the left of the main heart shaped space. b.x) What roughly looks like a bird head made from drift shows up in Levallois' image with perhaps a shorter beak but the eye is retained, and the shapes only dimly echo what was in Dali's painting to the point of being almost unrelated but just about imaginable. 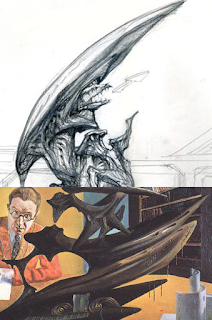 c) References Moebius Untitled illustration from 2010 (taking into consideration that it too appears to reference the portrait of Emilio Terry)?